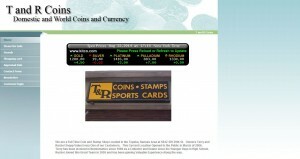 T & R Coins address, phone, website, hours of operation, and more. We are a Full Time Coin and Stamp Shop Located in the Topeka, Kansas Area at 5642 SW 29th St. Owners Terry and Rachel Snepp Value Every One of our Customers. This Current Location Opened to the Public in March of 2006. Terry has been involved in Numismatics since 1968 as a Collector and Dealer since his Younger Days in High School. Rachel Joined this Great Team in 2005 and has been gaining Valuable Experience Along the way.